What Is Cloud 9 Leisure? Cloud 9 Leisure is the new and exciting indoor leisure experience that’s launching in Greater London. Imagine a giant inflatable world for all ages where Ninja Warrior, Gladiators & Total Wipeout experiences collide. Cloud 9 offers all of this and more. 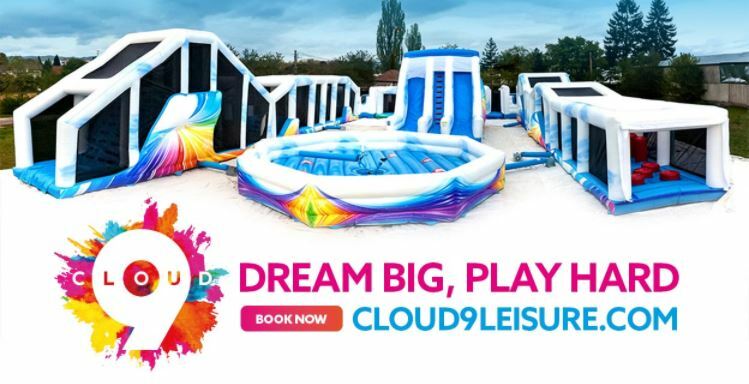 Opening November 2017 in four locations across Watford, Rickmansworth and Potters Bar in November, Cloud 9 has a wide variety of fun inflatable activities and games to be enjoyed by the whole family. Our giant inflatable world is a giant obstacle course, Dodgeball, The Sweeper, Human Table Football, interactive Bungee Run, Dash & Grab, Gladiator Duel and many more surprises, Cloud 9 is the perfect blend of family friendly fun and competitive physical activity. So whether you’re an adventure seeking 8 year old, an adrenaline fuelled 20 / 30 something, or just someone looking to stay active, Cloud 9 leisure has something for you. Visit our gallery to see what Cloud 9 is all about! Booking for Cloud 9 Leisure is now open, make sure you do so in advance to avoid disappointment when tickets sell out. The best way to do this is by visiting the Cloud 9 Book Now page. The price for a standard one hour session is £10 or £11, and £8-£9 for any consecutive sessions if you’re having too much fun to stop. To ensure you have a fun and safe experience, please make sure you look over our safety rules before the launch party. Everyone taking part will also need to be over 1m in height and sign the Cloud 9 waiver – this is mandatory.